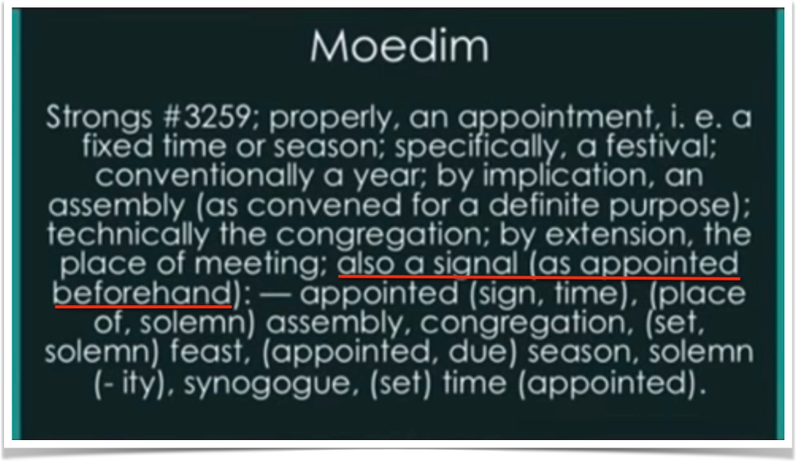 Scripture tells us in Genesis 1:14 that He gave us the sun, moon, and stars for signs, for appointed times (the original word here is mo’ed which means appointed times) for days and for years. Thus He set His calendar in the sky where no man could adjust it. This video uses an excerpt out of the passion for truth video which was looking a the Sabbath day. Interestingly, Jim Stanley recognises the verse, but is unable to see the truth he holds. Jim refers to the appointed times as a signal as appointed beforehand – This video covers this issue, that the signs are given before the event. Jim also refers to the signs of the second coming, which are seen in Revelation 12. Specifically these are the signs of the tribulation. I have posted more information about that here. Previous Post: Five witnesses of the Third Day. I am willing to share the word of Yahweh. 3557th Pesach should be kept at night of 30th March 2018 ONLY. Yahweh revealed me His Calendar Formula at last. Israelis didn’t keep 70 Land Sabbaths strictly from 1099 BCE to 609 BCE (5th year of the king, Solomon to the 10th year of the king, Zedekiah = 490 Luni Solar Years) according to Yahweh’s Luni Solar Calendar Formula (Lev. 25:8-9).Yahweh applied His FORMULA 10 times in 70 Weeks Prophecy. Present Jews are following inaccurate Chronology, History, and Grecian 19 – Year Cycle which is misleading all the Jews and Gentiles since CE 1948. The Word of Yahweh is now going out of spiritual Zion and Jerusalem (The Body of the Jewish Messiah) since CE 36 because of Micah 4:1-2 fulfilled already. I am willing to hear from you as we are the body of the Messiah and I need your suggestions (Jeremiah 31:31-33 cf. Romans 11:13-23; Ephesians 3:1-6, 4:11-16). As I am sure you are aware, the Gregorian calendar is not the scriptural calendar. The dateline of the gregorian calendar does not equal the line on the scriptural calendar as the scriptural calendar uses the new moon. Therefore, it should be expected that Pesach – held upon the 14th day at even, should actually overlap two gregorian days as the day does not start at the same place as the international date line. The new moon (the sign) is currently expected to be seen from Indonesia first and then seen by all those to the west upon the evening of the 18th of March. This means that those in Samoa, New Zealand and Australia, will not see the new moon until the following gregorian day, the 19th. This highlights how the gregorian calendar is wrong, as the scriptures use the new moon. A sign is something you see before an event, otherwise it is not a sign of things to come. Thus new moon day is expected to be the 19th and the 20th of the gregorian march. Fourteen days later, will bring us to the April 1, and April 2 (depending on where you live) – Yes. the day they call April fools. Not surprising it works out this way.